When Bad Things Happen–What to Do if You’re Attacked. On Friday, January 3, 2014, my family (my parents, husband, two young daughters–ages 1 and 3) and I were playing on Isla Verde beach in Puerto Rico when a man came out of the shadows, held a knife to my mom’s throat, and fought to keep her restrained while his accomplice took our belongings. I’ve written out my version of the attack, and you can read it here. It’s been five weeks since the attack in Puerto Rico, and we’re recovering well. If you are ever attacked, I hope this post can be of some help and comfort. What to do if you’re attacked. Give your attackers what they want. If you’re being robbed, hand over your money. It’s not worth getting hurt or killed to protect your wallet. 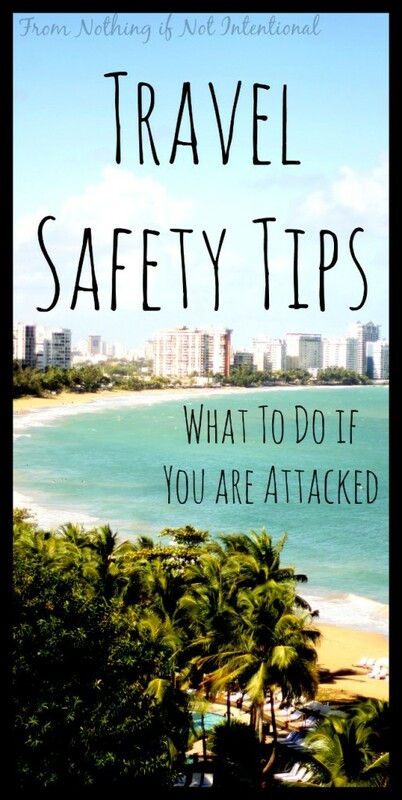 Read this post on travel safety precautions for info on how to potentially limit what you lose. Expect to have a fight, flight, or freeze response. “When you are attacked, the brain’s amygdala takes over and puts you into your natural fight, flight or freeze response. Most assault victims (e.g. the ones with the knives against their throats) freeze. They physically can’t get away or move, so it’s pretty amazing that your Mom was such a fighter! This was definitely the case in our situation. I have no clue how or when I decided to pick up my girls and run. I just did it. All I really remember is crying, holding my crying girls, and peeing my pants while the second attacker tried to pull me back. My mom clearly had the “fight” response. She didn’t know the assailant had a knife to her neck; otherwise, she probably would have frozen instead. 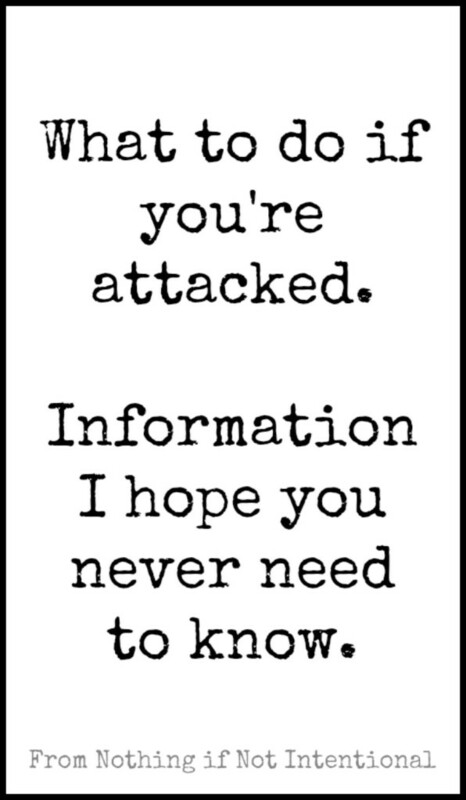 Try to remember identifying details of your attackers. After the attack, the police officers asked us to describe the two men. We couldn’t remember much. They were wearing hats. Or were they? They were smoking cigarettes. Or was only one of them smoking? They had beards. No, they were clean-shaven. It’s all a blur. We couldn’t find them in a lineup if we tried. Don’t blame yourself–not even a little bit. Even if you made mistakes, you are the victim. The attackers are the ones at fault. Wise people reminded me of this after our attack and encouraged me not to focus on what we could have done differently. We try to never sound shocked or surprised by her stories, questions, or ideas. For instance, just this morning (5 weeks after the attack), she was hiding in her closet “pretending like she was running away from the bad guys in Puerto Rico.” I didn’t have an exaggerated reaction or show disapproval. I acknowledged what she was doing, and a few minutes later she moved on to something else. A harder issue has been when she sees someone making a bad choice (e.g. stealing a toy from a friend, pushing) and she labels them “bad guys like the ones in Puerto Rico.” We tell her that people and friends make bad choices, but her friends aren’t bad guys. We also have been talking a lot about forgiveness. We pray for the bad guys, and we talk about how great it is that God forgives anyone who asks. We want her to know that God is a God who forgives and redeems. She keeps asking us if God will take the blade (how did she learn that word?) away from the bad guys. Here are a few books that were recommended to me: Sometimes I’m a Bombaloo and When Bad Things Happen: A Guide to Help Kids Cope. Embrace role playing and play therapy. As cheesy as it sounds, characters, skits, and mini plays can help kids to process. My mom (an elementary school counselor at the time) used to role play with me to help me to practice things like saying no to strangers and turning down drugs. This can also be used to help kids process their feelings after bad things happen. For example, you could have a puppet ask your child questions in silly voices to make the conversation less threatening and serious. Seek out a professional. My mom is a counselor, our daughters are very young, and we have no physical scars or reminders of the attack. Therefore, we chose not to seek family counseling. However, if our girls were older, this would have been an option we pursued. “In a situation like this where you have not only you, but your family to worry about, do whatever it takes to make the criminals comfortable and give them what they want. Money and belongings are replaceable. Don’t fight or scream if you can determine that all they want is what you have. Give it to them and let them leave. This is not the response to have if the attacker is trying to harm or kill you and/or your family. In a situation like that you do whatever you have to, to win. But in this situation, the biggest key is to try to remain calm and not give any reason for the attacker(s) to consider you a threat. The more comfortable and safe they feel, the less likely they are to hurt someone over money and valuables. Their mindset is not to hurt or kill, but to steal and run. Don’t risk your safety to protect replaceable things. Don’t expect to move on right away. When we were in Puerto Rico, I started sweating and breathing fast the first night we went out for dinner after the attack. We had to park in a parking garage and take the elevator with a group of guys. I now know I am vulnerable. Back home, I’m no longer having daily flashbacks, but I’m much more guarded. I was angry when carpet cleaning salesman made eye contact with me through my front door the other day, and I felt obligated to open it. I now suspect strangers, especially men. When I’m loading and unloading the girls downtown by the museum, I rehearse what I would do if one of the people walking past us tried to grab one of the girls. I no longer assume everyone is benevolent and kind. On the other hand, don’t be paralyzed by fear. After the attack, we didn’t pack up and fly home right away. We stayed for three or four more days like we originally planned. Was it hard to play on the beach in the EXACT spot where we were attacked? Yes, of course. And a few people have asked us if this will change our travel plans. Yes. And no. We’ll travel smarter, but we’ll keep traveling. Thanks for sticking with me to the end. If you haven’t already, we’d love for you to subscribe to email updates and/or follow along on the Nothing if Not Intentional facebook page.